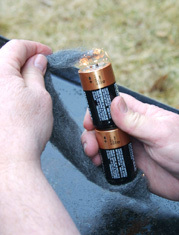 An easy and dramatic way to start a fire is to use two flashlight batteries and a strip of grade 00 or finer steel wool. Cut or stretch a piece to about 8 inches in length. Align two good flashlight batteries on top of each other in an upright position (as if they were placed inside a flashlight). Hold one end of the steel wool strip against the bottom of the lower battery. Carefully rub the other end of the steel wool across the “nub” of the upper battery. As soon as the steel wool sparks, place it on tinder or other burnable material and slowly blow on it. As you blow, the flame will grow more intense. This method works very well for starting a fire in windy areas. For safety reasons, always pack the steel wool and batteries in separate containers.